Waterproof LEDs are designed for use as visual indicators in harsh environments. In addition to being waterproof, these also have superior protection against dust and particle penetration. Once assembled, the sealed LED units can withstand being under water to a depth of 1 m for as long as 30 minutes. These are ideal for applications such as outdoor equipment, marine devices and industrial units such as testers, generators, and displays. Components that are used in any environment which is subject to excessive moisture or non-corrosive fluid submersion should be IP67 rated (minimally). ASSMANN WSW components is a supplier of waterproof LEDs which are IP67 rated. These are available in either a metal or a plastic housing, with solder pins for easy installation. 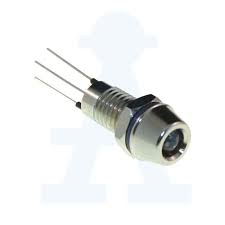 The LEDs with plastic housings come with a 3.0mm diameter LED. The LED holder is made of black PC+ABS and the O-ring is made from a synthetic rubber, “EPDM (ethylene propylene diene monomer, M-class)” , for a secure weather-proof and dust-tight seal. The glass-filled nylon, 10mm bezel (screw nut) and threaded body is fitted to each LED. The LEDs are available in green, blue, red, yellow and white. The IP67 waterproof LEDs with metal housings come with 3.0 mm or 5.0 mm diameter LEDs. The 10mm brass bezels are nickel-plated, and the threaded bodies are fitted to the individual LEDs. A neoprene O-ring, in place of the EPDM used with the plastic housing, is added for the environmental seal. As with the plastic housing unit, the LEDs are available in green, blue, red, yellow, and white. An additional option for dual color green/red is also available with the metal housing. In all configurations, the luminous intensity is specified as maximum of 6,100 mcd (millicandela – the intensity or brightness of the emitted light). The output depends on the color, as each color has a different mcd rating. For either housing type, the typical input voltage is 3.5 V at 20 mA, with a maximum of 4.0 V at 30 mA current rating. These devices are suitable for use in environments between -40 and 80°C. The maximum mounting panel thickness is 6.5 mm.